This game was entered into our Large Variant Contest of 1999. Some time later, the inventor of the game asked for his copyrighted material to be removed from the site. For the sake of keeping a complete record of the games entered into the contest, the game is described here independently without any text or graphics from the inventor. The Nightrider moves like a Knight any number of times in the same direction. Until it reaches its destination, each Knight move along its path must be to an empty space. 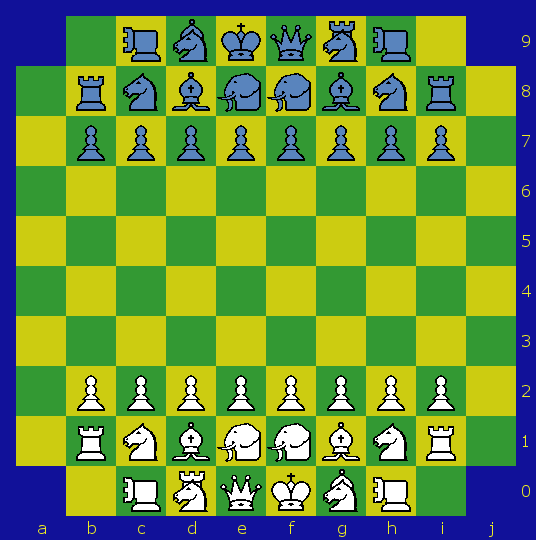 It is like a Rook or Bishop but for Knight moves instead of one-space moves. The Cannon, borrowed from Chinese Chess, moves as a Rook except that it must hop over an intervening piece to make a capturing move. The Archbishop moves as a Knight or a Bishop. The King moves one space in any direction, the same as it does in Chess, but it may not castle. The Queen moves any number of spaces in any orthogonal or diagonal direction, the same as it does in Chess. The Chancellor moves as a Rook or a Knight. The Rook moves any number of spaces in any orthogonal direction, the same as it does in Chess. The Knight leaps directly to any space at the opposite corner of a 2x3 rectangle, jumping over any pieces in between, exactly as it does in Chess. The Bishop moves any number of spaces in any diagonal direction, the same as it does in Chess. The Mammoth is inspired by the the Elephant, but it is more mobile, leaping one or two spaces in any diagonal direction instead of just two. Besides these moves, which may be capturing or non-capturing, it may move one space orthogonally to capture a piece. So, it may capture any enemy piece it is adjacent to. The Quick Pawn moves like the The Pawn in Chess, but it may make a double move from any space, and it cannot be captured by en passant. Upon reaching one of the last two ranks, it may promote to any piece that began on that rank. Promotion on the last rank is madatory, but promotion on the next-to-last rank is not. For the most part, this game is played with the same rules as Chess. Besides the details mentioned above, the 50-moves draw rule is a 75-moves draw rule, and the draw is automatic.